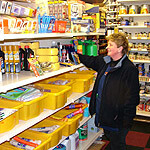 Locally known as 'Arkwright's' Stuarts Hardware carry an enormous range of products for trade and home buyers alike and what's more if we don't have it in stock we can order it for you! Located at the top of Gibbet Street, the business was started by Stuart Greenwood in 1992 and has gone from strength to strength over the years with the addition of staff and the acquisition of new lines. Richard joined the family business as a partner in 1994 and began to look for expansion opportunities. 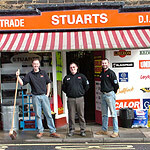 With the closure of several small local businesses over the following years Stuarts Hardware began to fill the gaps left in the market by their demise. This eventually led to Andy joining the team who, with 20 years in the building supply and equipment hire trade, helped expand the trade side of the business further. 2004 saw major extensions to the business with a trebling in size of the shop floor and the take over of a bottled gas supply company. As well as supplying from the busy trade counter, deliveries can be made , covering the remotest parts of Calderdale and surrounding areas.